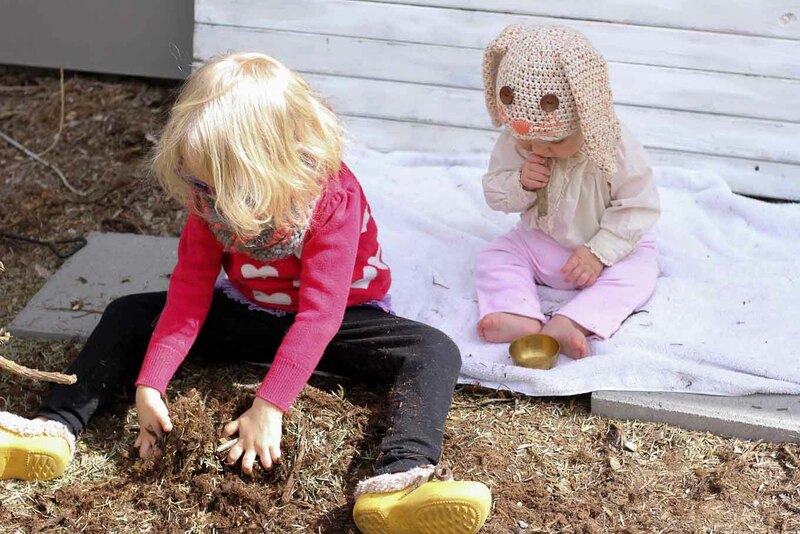 This free crochet bunny hat pattern is easier than it looks and makes a darling Easter accessory for your favorite baby or toddler. 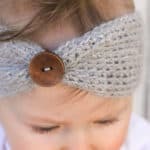 I’ve started to worry lately about what I will crochet when I don’t have a cute baby head available to accessorize. 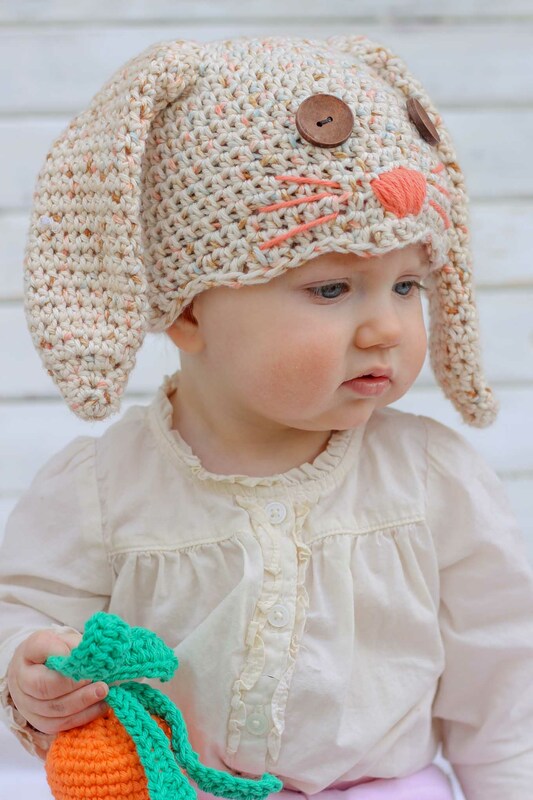 I guess I will just have to make patterns for cute 6-year-olds and 8-year-olds and 11-year-olds…and then after that…well, I’m sure my kids will be shopping at Forever 21 at that point and probably not for crocheted bunny hats. So, I’m going to enjoy this cute animal hat chapter while I can. Mo actually loves getting new crochet projects every week or two. Quinn, on the other hand, has just turned the corner into the I-will-remove-anything-you-put-on-my-head-no-matter-how-many-thousands-of-times-you-try stage. So needless to say, photographing this hat was a challenge. 391 pictures later (no kidding–thank goodness for digital photography), we got a few good ones. I think this might be the last headwear project Quinn’s going to get for a while. It’s quite quick to whip up and the only stitches used on the main body of the hat and ears are a half double crochet (hdc), half double crochet decrease (hdc-dec) and a chain. The scalloped edging uses a slip stitch (sl st), single crochet (sc), double crochet (dc) and a triple (aka treble) crochet (tc). 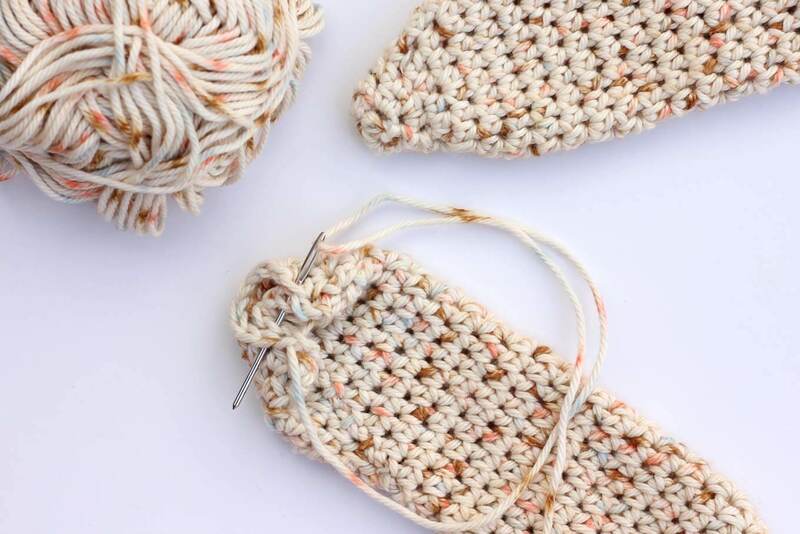 If you’re a beginner crocheter, this project is a great way to learn a few new stitches. 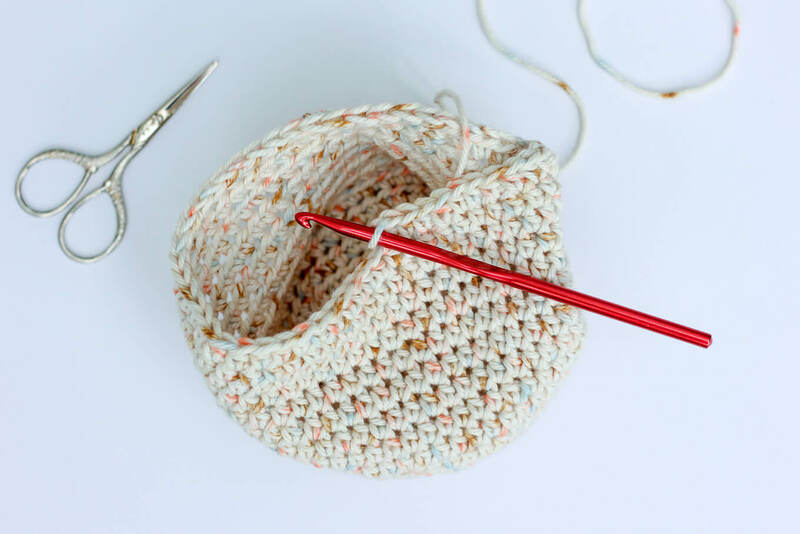 But if that sounds overwhelming, you can just leave off the scalloped edge and add one more row of half double crochets instead. The hat can be made with or without the face details. Originally, I thought I’d prefer it without eyes, nose and whiskers, but after a day of looking at it, I decided to add them. It’s totally up to you. I wrote this pattern with sizing for newborns (0-3 months baby), 3-6 months, 6-12 months and toddlers/preschoolers. 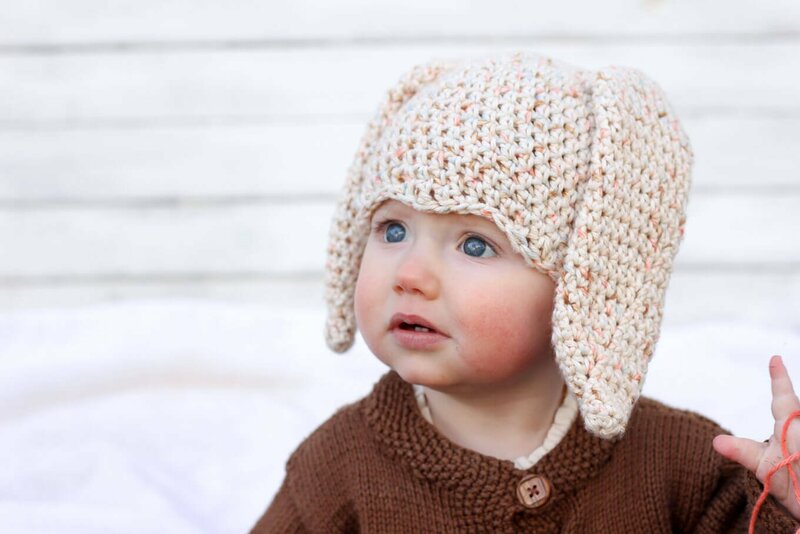 The complete free newborn bunny hat pattern is below. The larger baby and child sizes are in our exclusive subscriber Vault. Simply enter your email address in the pink and green box at the bottom of this post to gain instant access to additional sizes of this pattern and lots of other free crochet patterns. You may make items to sell with this pattern. In exchange, please link back to my homepage (MakeAndDoCrew.com) as well as this post page. Do not use my photos as your own sales photos. Do not distribute this pattern as your own. Okay, let’s make something awesome! Subscribe below for additional sizes of this free pattern. Sew button eyes on. 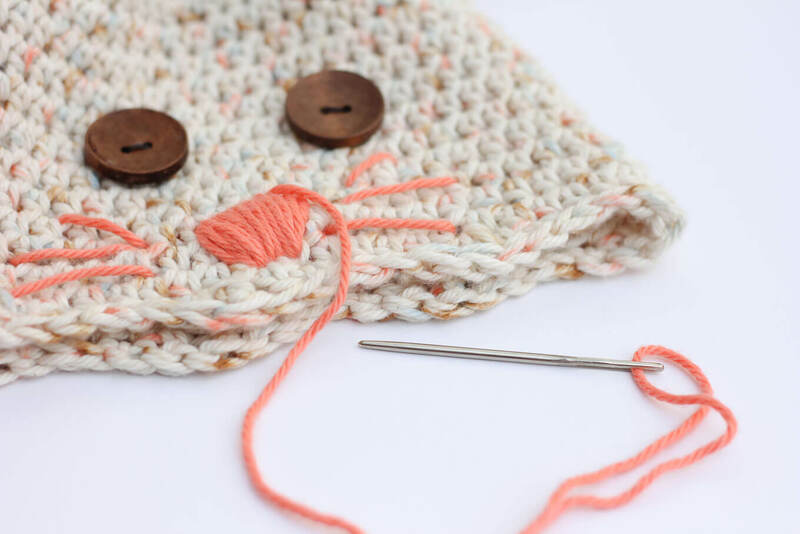 Use accent color of yarn to add a nose and whiskers as pictured. 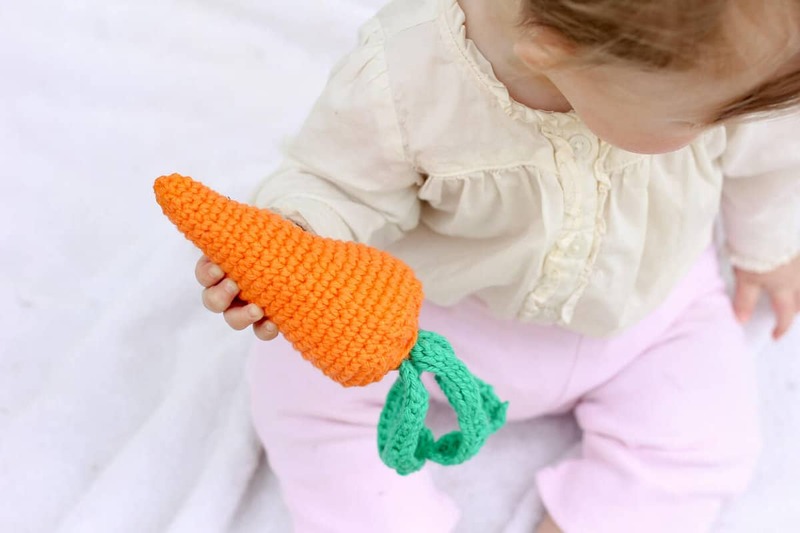 Now that you’re feeling like a DIY rockstar, peruse my archives to find your next Easter project or free crochet pattern–especially the yummy free pattern for the carrot rattle! Snazzy blog photos can make it look like some people are doing it all (effortlessly!) while others of us (me!) are barely holding it together. So whenever I can, I like to introduce a little reality check in the form of a very un-Pinterest-worthy detail from my perfectly imperfect real life. My hope is that it’s a helpful reminder to anyone reading that NO ONE is doing it all perfectly. Don’t let all these airy, luminescent baby pictures give you the wrong impression. My kiddos were digging in the dirt and chewing on sticks in between each photo. How else are they going to learn to be real bunnies?! DOWNLOAD ADDITIONAL SIZES OF THIS PATTERN! Plus other free patterns that will knock your little handmade socks off. You're in! Welcome to the Crew! Please check your email for download instructions. 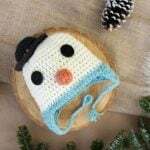 Free Crochet Hat Pattern–a Baby Snowman! hi jess! thank you for visiting me and such a delight to find your blog! Thanks so much, Ananda. I have been thinking about your book list since I found it a couple of days ago. I love that you include the “Abraham” books on it. My mom took me to watch Esther channel Abraham when I was in high school. It was incredible. We used to listen to the cassette recordings of their conversations when I was even younger. It’s great stuff! adorable and the hat is awesome! 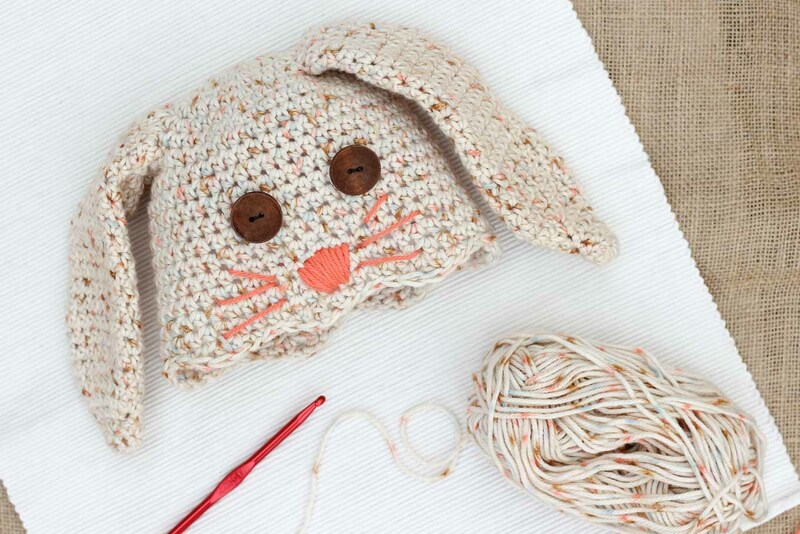 who wouldn’t want a crochet bunny hat! thanks for sharing the pattern with us! I did and it keeps telling me the same over and over I need to subscribe. Adorable pattern! I’m going to try sizing it up for my 13 year old. Maybe make the ears a little longer so she looks goofier ha ha. I’ll send you a pic of it turns out ok. All I will do is upsize my hook and yarn. Doing that can get tricky with hats but I will still try. Thanks so much for sharing and adorable pictures with the post. I love that idea, Tracy! And I would LOVE to see a pic. The way the ears are crocheted, you could definitely just add a few extra rows toward the end to make them longer. I have a few other hat patterns in the subscriber Vault with teen/adult sizes if you want to reference them for stitch counts on the hat. Best of luck and let me know how it turns out! Thanks again for pointing it out. I’m sure you’ve helped someone else out by finding that error and you’ve certainly helped me! I’m sorry you’re having trouble printing. Are you attempting to print it straight from the blog post or from the PDF you downloaded from The Vault? It sounds like you got the file from The Vault and now aren’t able to print it? I’ll just go ahead and email it to you as a Word doc and perhaps that will work. Please let me know if you’re still having trouble! 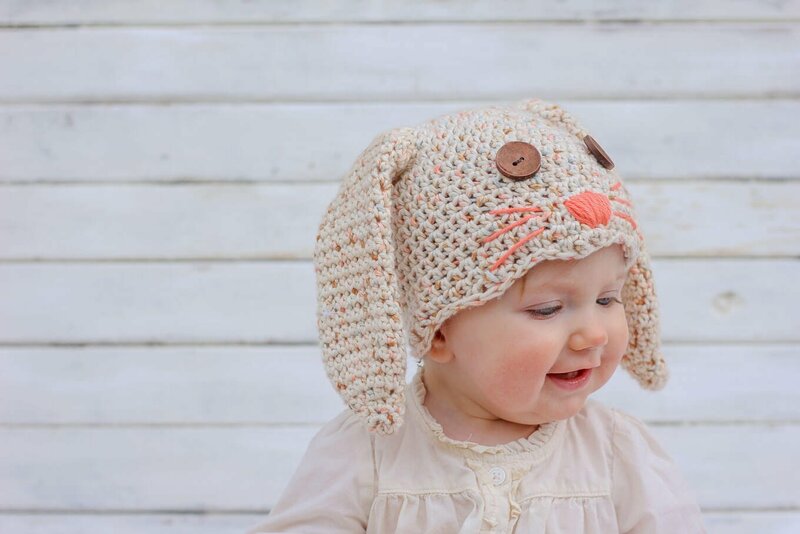 I’ve been trying to get the Free Subscriber Resources….the larger pattern for this bunny hat. Even after signing in…case sensitive and no spaces….I am still not getting any other sizes. Am I doing something incorrectly? I’m not so concerned about the hat…I can size that up, but I was wondering about the ears. Do they get larger with a larger hat? The ears do size up with the larger patterns. I apologize that you’re struggling to access the pattern. If you’ve got the welcome email with the PW in it, perhaps try copying and pasting the PW directly? I’m not sure why that wouldn’t work. I haven’t heard anyone else having the same problem, but I’ve very curious what might be up with your situation. Please let me know if that doesn’t work and I’ll just email you pattern directly. I don’t want anything to stand in the way of your crocheting. This is an adorable pattern. I have a friend who will be a first time grandmother and want to make this for her grandson. I would also love to add that carrot, if you have the pattern for it. What cute little extra toy. They would also make great auction pieces for the school/choir fundraisers we participate in each year. I’d love it if your friend used my pattern for her new grandson! Here’s the link to the carrot toy as well. And feel free to make these for your fundraisers! 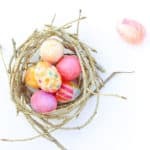 I’d love it if these patterns helped you raise some money! 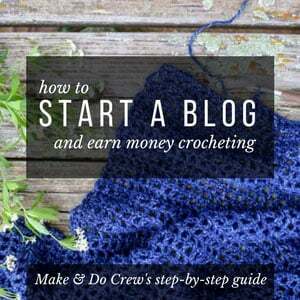 I just ask that you credit Make & Do Crew with the pattern and link to my site if you’re sharing them online. Thank you for supporting M&DC! This bunny hat is so adorable. if only I had a baby around to make one! This is really a great post..
Congrats on your future niece or nephew! I’m glad you found my bunny pattern and hope you and your sister enjoy it! So many amazing headpieces on this website! I LOVE this week’s reality check moment. It is so refreshing and fun to see the “behind the scene” proof of what actually goes on. The carrot toy is the perfect pairing. BTW- do those cheeks come with the bunny hat? Where do I find the pattern for toddlers? It’s in the subscriber “Vault” (a password protected area where I share the best freebies, printables, etc.) If you subscribe in the box at the bottom of this post (above this comment area) or on the side of the page, you’ll immediately get at email that tells you how to access it. Please let me know if you have any trouble. I’m happy to help! Es realmente hermoso! Me gustaría la traducción a ESPAÑOL pudiera ser? Fantastic hat! Can’t wait to start making it. Hello from the US! If you go to the Vault and click the link right below the bunny hat photo, you’ll open the pattern. The other link below that takes you back to the blog post. Were you able to download it from the Vault? If you enter your email address above, you should get an email with a link and password to download the pattern. Let me know if you need more help! I love this pattern and have sent email request for larger sizes and hopefully will receive them as I need to make in the larger sizes. I did make the ears and add to a basket to make a “Bunny basket” which is cute – although sometimes when I look @ it I think it resembles a puppy! Lol–even a puppy basket sounds cute! I hope you enjoy the larger sizes! Oooh, a bunny hat that my toddler grandson will like. Can’t wait to get the pattern in a larger size. Hihii! Just came across this and was wondering what weight yarn you used? for my two year old granddaughter. Can’t wait to make this for my perfect little baby. 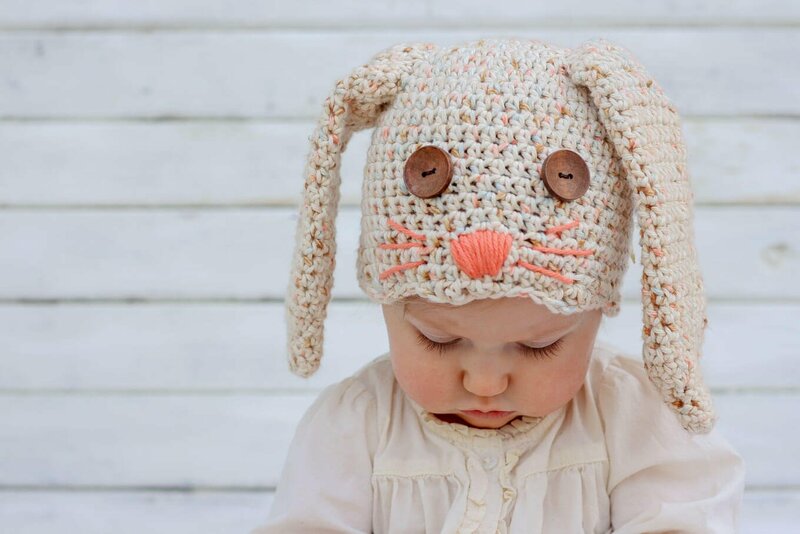 I’m not able to find a way to get the bigger size patterns for the bunny hat…help, I may be doing something wrong? How are you joining to the rows together? Everything I try results in extra stitches. I emailed the pattern to myself and now I don’t see where I can print it? Am I doing something wrong?? Did you subscribe to the vault and download the PDF? That would be the best way to print it. The PDF if free when you put your email address in the box above. You’ll an email with download instructions.